For most of the country, afternoons at the beach are out of the question, and so are the hours and hours of sunshine that make it easier to get to the gym early in the morning or late in the evening. Instead, most of us are faced with dropping temperatures and decreasing amounts of daylight, a combination that can make it hard to stay motivated. We know. We’ve been there, too. But just because winter’s here doesn’t mean you should stop hitting the gym. It’s all a matter of perspective, so we called up Jay Cardiello for some help. The Gold’s Gym Fitness Institute expert and personal trainer to celebrities gave us five tips guaranteed to help stave off those winter blues. According to a study by researchers at Appalachian State University, people who spent at least 20 minutes doing moderate aerobic exercise five times or more per week were sick about 60 percent less than people who didn’t. The theory is that endorphins, which are released during exercise, have positive immunity-boosting effects that last well after when you stop sweating. 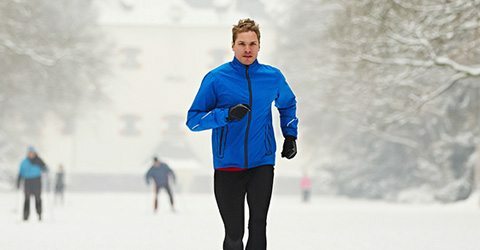 Researchers from Maastricht University in The Netherlands found that being cold helps burn calories, which makes sense when you think about it from a physiological perspective. Your body is working harder to regulate your core temperature, which means it needs more energy, which means it will shred calories quickly. A separate study reported that both exercise and cold helps turn white fat into brown fat, a substance that burns calories even faster.